are the front-line guardians of natural resources"
Mission Beach is a high biodiversity area situated between the World Heritage Wet Tropics and the Great Barrier Reef. It has has exceptionally high scenic values with the rainforest growing down to the sea, pristine beaches and off shore islands. 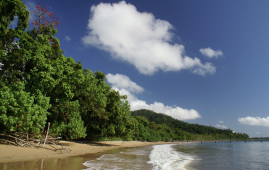 Surrounded by World Heritage the whole of the Mission Beach area has World Heritage values with all the natural vegetation mapped as essential Cassowary habitat. There is a wide range of threats to the biodiversity and scenery of the Wet Tropics. The Mission Beach area is particularly under threat due to inadequate planning schemes that have allowed destruction and fragmentation of natural areas including important wildlife corridors. Biodiversity - a kind of washing powder?